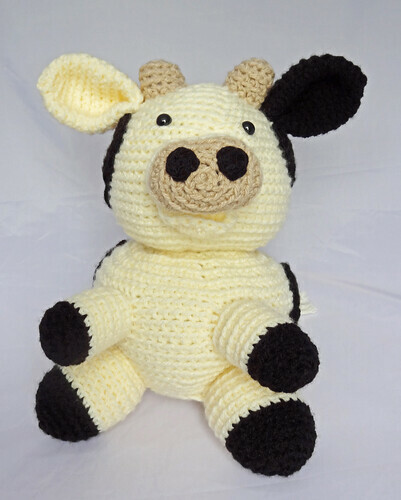 No, someone hasn't been unpleasant to me, I literally have a cow that is complete. 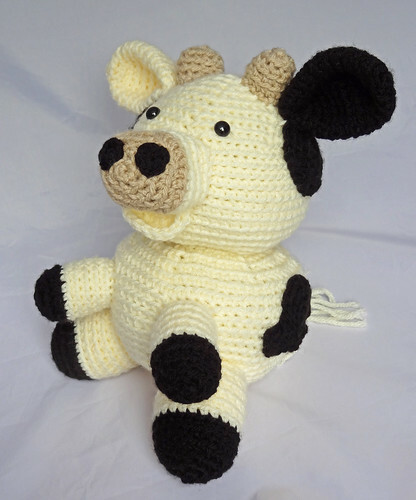 Do you remember I told you about FreshStitches Crochet-a-long (or as I refer to it in my head cow-a-long)? Well I've finished - and done a photoshoot that doesn't involve plonking it on a chair! So may I introduce you to my new favourite toy - the cow! 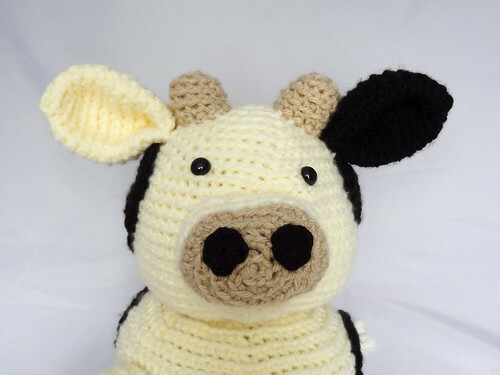 I suppose I should name my cow, the pattern is called Jackie, but I feel that my cow has a different personality to Jackie, she is more of an Ermintrude type of cow, even if she isn't pink! For those of the incorrect age and nationality to understand my reference, here is a little video of a children's classic from the seventies - The Magic Roundabout. As with my Teal Bird, I made Ermintrude with Hayfield Bonus Chunky. 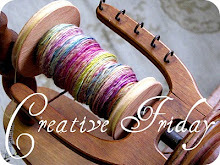 It is a great (read cheap) yarn for toys as it is 100% acrylic and therefore washable. I LOVE using chunky yarn for amigurumi as it gives you a lovely sized toy. This pattern is around the same sort of pattern size as the teddy bear, designed by Stacey Trock from my Craftsy course, which was crocheted in Cascade 220 Superwash, which is worsted weight. I took a photo to compare sizes. As you can see, it makes quite a difference to the overall size. This pattern had lots of fun details on it, I particularly love the face. 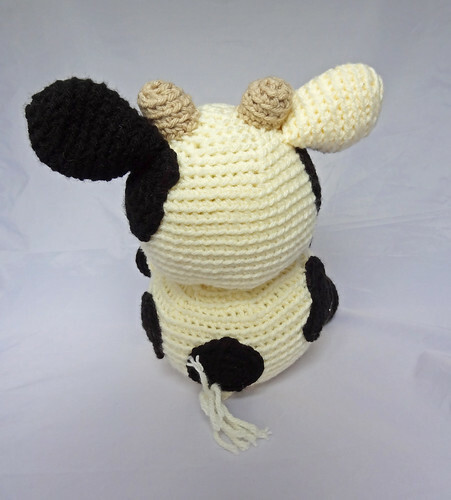 The spots are made by crocheting two shapes and then sewing them together before sewing them to the cow. In the photo above, you can also see the tail, which is a lovely little detail. As with all my toys, I sewed my label onto Ermintrude's bum! I love this toy and it is sitting quietly by the fireplace, waiting for a visit from a child, to be played with. This is one toy I am not giving away (for a change). Ermintrude is a decent size to be ornamental, until a child wants to pick her up. My other half agrees, that this a cow with attitude, that can stay and keep us company. 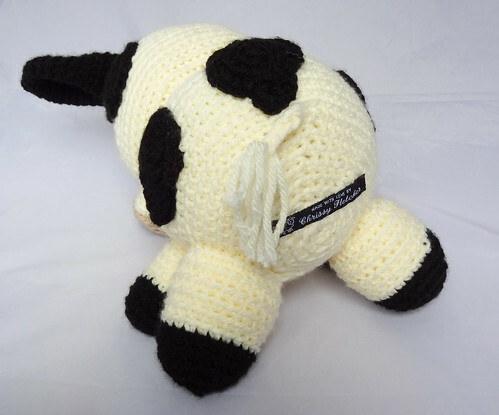 I'm so glad I took part in this cow-a-long and I know it won't be long before I'm crocheting another of Stacey's patterns, as I pre-bought the Choose Your Own Dragon Adventure that is due for release this week! This is another pattern that will work brilliantly with chunky yarn - I had better get choosing my colours! 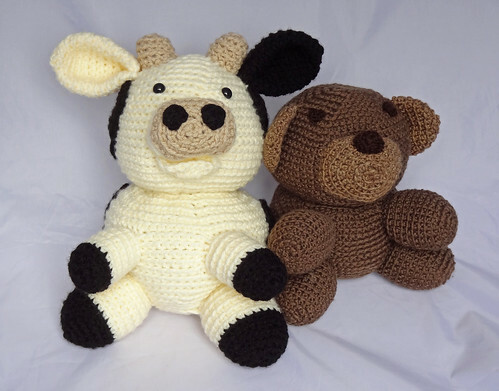 To see other finished projects, click on a button.